October 13, 2014 By Tiffany 11 Comments By clicking on our links, we might make a SMALL commission - Thanks for the support! See our full DISCLOSURE here. I am completely obsessed with Mini Pumpkin Pies. 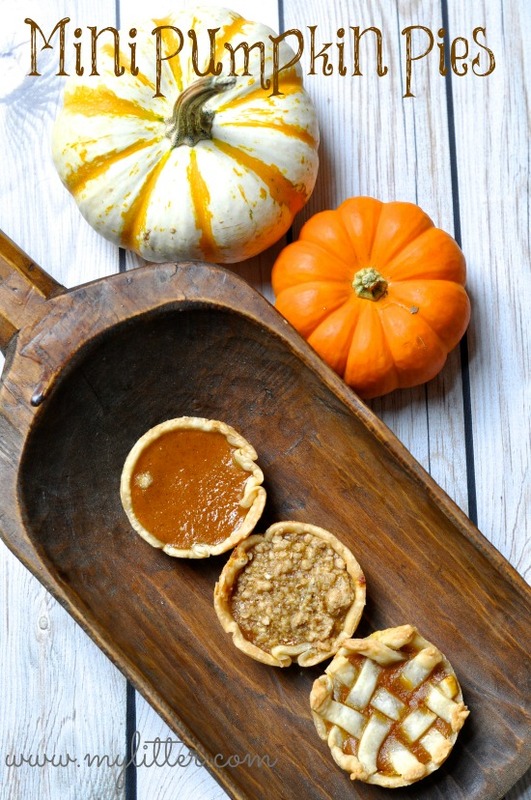 I think it is really just mini stuff in general, but the pumpkin pies are so darling this time of year I am in love! You might remember this summer the Mini Cherry Pies and the Mini Quiche the girls and I made, well same idea, just different filling! The Mini Cherry Pies post has a long tutorial on how to cut out the pie dough and bake them, I will spare you the details again. 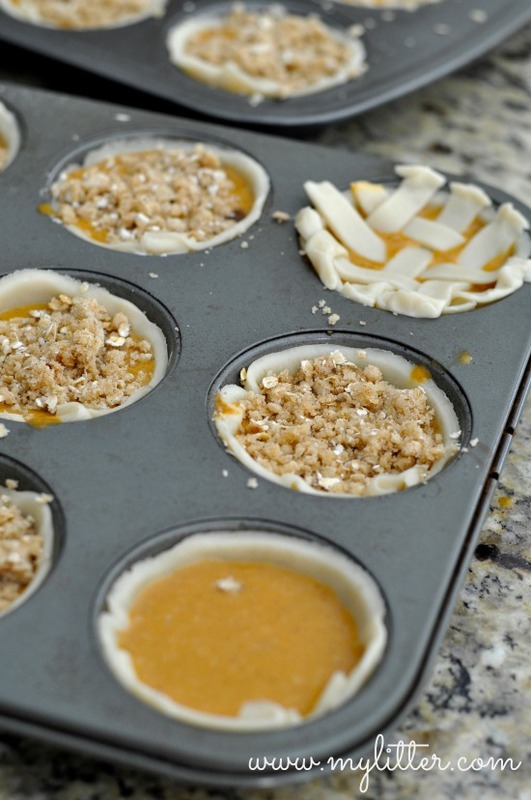 Just cut out the pre-made pie crust with a large cup and press them in a muffin tin. Make your pumpkin pie filling following the recipe on the Libby’s can. Fill each cup about 3/4 the way full. I did 3 different kinds of toppings, well 2 at least and left one like a traditional pumpkin pie. Topping#1 – Like the cherry pies I made a lattice out of dough. These take longer but I think they are the cutest! Topping #2 – I added a streusel topping from soft butter, oatmeal, brown sugar and flour plus a little bit of cinnamon. 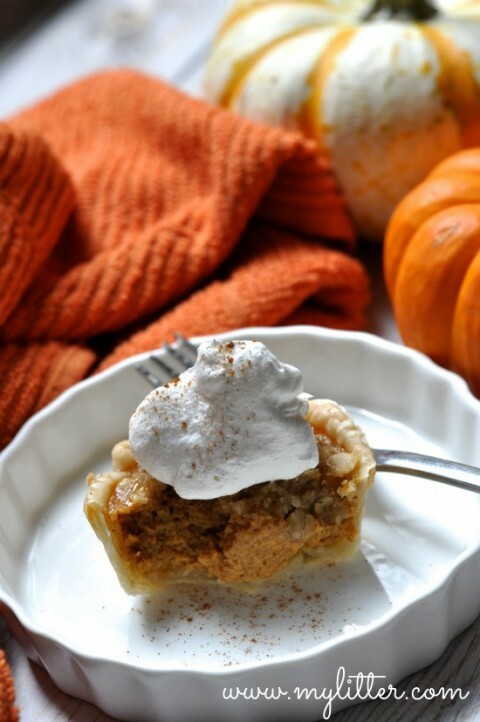 Topping #3 – 🙂 No topping just traditional pumpkin pie. Bake them for about 20 minutes or until the center is firm and let cool. Remove from the muffin tins and serve. Obviously cool whip and ice cream go perfectly. I think the thing about the mini versions is that you love that they seem personalized even if they really aren’t. How many times have you wanted to eat an entire pie?? Well you can now! 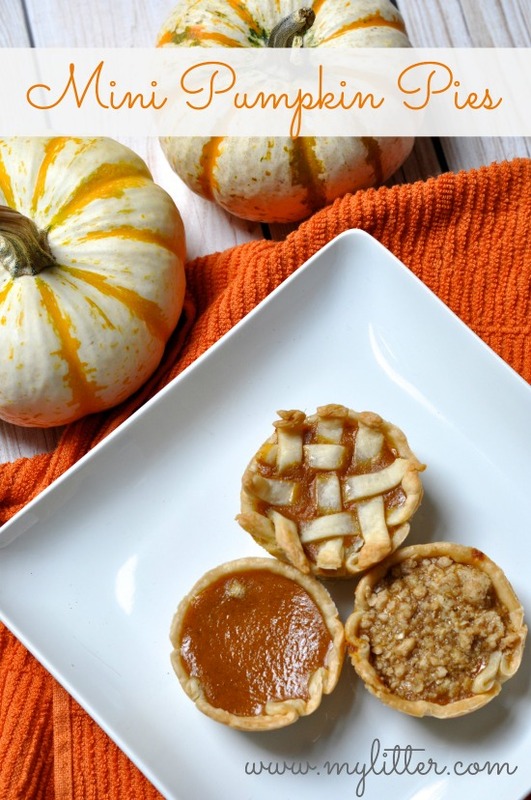 Question re: mini pumpkin pies — You say bake for 20 min. but at what temperature? Same as large pies??? Tiffany, do you have the directions on the streusel topping….looks amazing! All i did was mix soft butter with a little flour, oats and brown sugar! I dont know if I could even tell you measurements… Maybe 2 T butter, 1T each flour and oats then 1T brown sugar?? Alright then, I will try it out! Thanks so much! Making these tonight for Thursday. They smell fantastic. I made these for Thanksgiving and they were a hit! Best of all it was so easy. I will be making these every Thanksgiving. Thank you! How many mini pies does this make? I’m thinking I see what would be 2 dozen, but I wanted to make sure! Thanks! Yes I think that is exactly what I got out of it! I love this idea Tiffany! Thank you.